Re-released due to public demand for Record Store Day 22nd April 2017 on LP (Limited Edition 180 gram Green vinyl, 500 copies) via Bristol Archive Records. 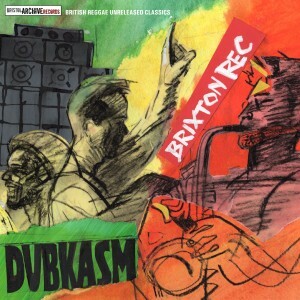 Leading lights in the 21st century UK digi dub/roots scene Dubkasm have built themselves a worldwide following for their brand of reggae since launching their own Sufferah’s Choice label in 2003. What many fans may not realise is that even before that first Sufferah’s Choice release, Dubkasm had nearly a decade’s worth of recordings behind them. Unfortunately, other than a track on the 1996 “Dub Out West Volume Two” compilation album, those early recordings were the preserve of leading UK sound systems such as Aba Shanti and Jah Shaka and could only be heard played off dub plates at dances. Dubkasm have finally decided that the time is right to share the story of those early years and make a selection of those formerly exclusive tracks available for everyone to enjoy. Being proud of their Bristolian roots, Dubkasm found the perfect partner for the project in Bristol Archive Records and the label’s ongoing programme to document and make available Bristol’s reggae heritage. As if a selection of previously unreleased tracks from Dubkasm wasn’t enough, these particular tracks were all played by leading sound system operator Aba Shanti and the versions were all personally mixed by him to achieve the ideal sound balance on his sound system. Once Dubkasm’s Digistep had finished initial mixes of the tracks, he would deliver the multi track master to Aba Shanti who would then mix down his own exclusive versions. It’s the Aba Shanti connection that inspired the album’s title, for it was at Aba’s legendary sessions at the Brixton Rec that these tracks could be heard to full effect. The album is named in tribute to those great sessions and hopefully the music captures a bit of that magic as well as bringing back some great memories for those who were there, or even those who were only there in spirit through the medium of sound tapes. Thanks to DJ Stryda’s long standing Sufferah’s Choice radio show Dubkasm are in contact with many of the scene’s leading players and four of the vinyl’s eight tracks are vocals with contributions from Tena Stelin, “The Soul” and “Spiritual Warrior Time”, the deeply missed Lidj Xylon, “The Order” and Bristol’s own, and Dubkasm regular Ras Addis, “Jah Bible.” Each of the vocals is accompanied by its dub counterpart and each track is UK roots of the highest order. Recorded in a basement studio, Ghosts is a manifesto of work spanning a five year period. The band were in no hurry to produce your average throw away sing along but, rather hell bent on making a record that would stand the test of time. 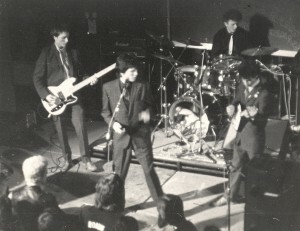 The four piece group from Portishead, near Bristol in the UK, definitely contributed to shaping what is now known as the Bristol sound with their domineering live presence and stellar reputation as professionals in their field. Airbus take you on a vivid dream-like journey through unpredictable, surreal twists and turns to arrive at ultimate clarity and realization. Yes, guitars, bass and drums tastefully back the velvet vocal tones to create melancholic harmony but, like the chameleon, the band’s multi instrumentation is also ever present as they push and pull the boundaries of contemporary British rock music. They had cut their teeth in Bristol’s blooming music scene during the early and mid 1990′s and were fortunate to be invited to reconstruct a song by their critically lauded and commercially successful contemporaries, Portishead, for a USA release showcasing the band’s unique style. Having spent a lifetime’s career, at that point, of playing live shows, Airbus then embarked on what would become a five-year marathon in the studio. They were meticulous about preserving the original ideas for each song written. There were several studio engineers that came and went but, Airbus’ attention to detail resulted in them becoming four very competent recording engineers themselves along with a huge catalog of quality compositions. Ghosts is a refined and complete album that sits at the top of a mysterious, creativity-crammed volcano, that is active and bound to erupt at any time! Additional instrumentation : Glockenspiel, Korg micro preset synthesizer, Fender Rhodes, Hammond organ, upright bass, Roland Space Echo and acoustic guitar. Sad news – Kevin Leadbetter the original Joe Public vocalist circa 1978 passed away today – another sad loss from our musical history aged 55. Three of Bristol’s most legendary heavy rock acts are getting back together for a special charity show, offering local fans the opportunity to see them on stage for the first time in decades. 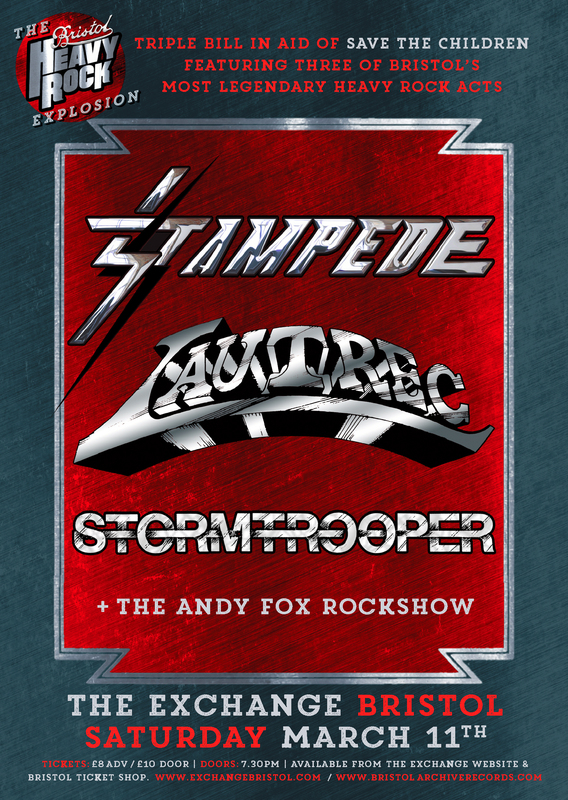 Stampede and Lautrec will be joined by the city’s pioneering New Wave of British Heavy Metal (NWOBHM) act Stormtrooper at the Exchange on Saturday, March 11th. Helping to recreate the authentic vintage Bristol rockin’ vibe, the Andy Fox Rock Sound System will be pummelling eardrums with carefully selected classics. Staged in aid of Save the Children, the gig comes hard on the heels of the commercial and critical success of Bristol Archive Records’ latest compilation The Bristol Heavy Rock Explosion. This was described admiringly by Classic Rock magazine as “a welcome antidote to the simplistic official narrative” of Bristol music. 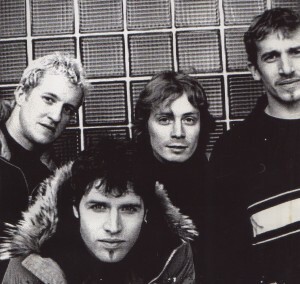 Stampede were one of the most musically accomplished melodic rock bands to come out of Bristol. Founded in 1981 by vocalist Reuben Archer and his talented guitarist stepson Laurence, they signed to Polydor and played the prestigious Reading Festival, where they recorded a live Official Bootleg album. This was followed by the excellent Hurricane Town. After a long period of inactivity, Stampede reunited in 2009 and released a new album, A Sudden Impulse. 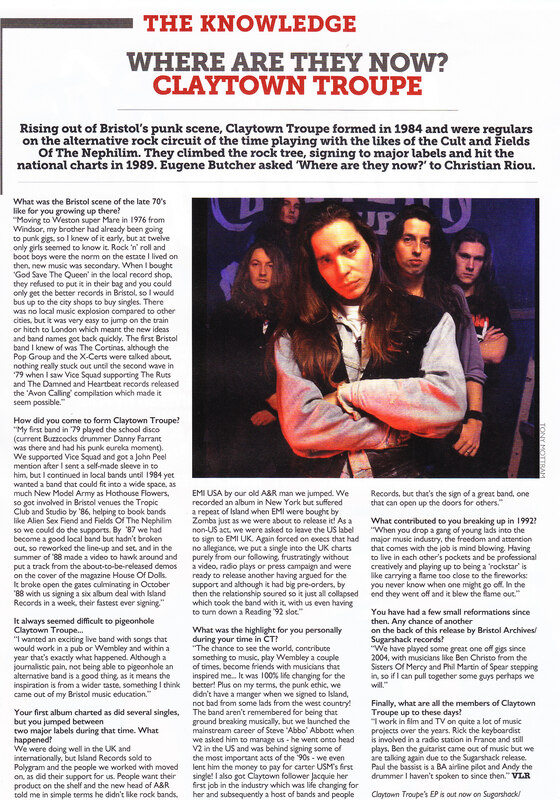 Back in December, they played at the Hard Rock Hell NWOBHM festival with fellow Bristolians Jaguar. 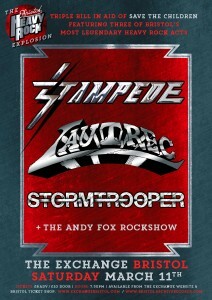 Stormtrooper were one of the unsung greats of the New Wave of British Heavy Metal. They’re now finally receiving the appreciation they so richly deserve following the belated release of the ‘lost album’ Pride Before a Fall on Bristol Archive Records. Indefatigable band founder Bob Starling went on to form the classy Hunted in the 1990s. Their Fallen Angel collection has also just been released by Bristol Archive Records.